This hip little riverfront resort in Pacific Harbour, The Adventure Capital of Fiji, offers affordable, stylish accommodation to vacationers, families, divers, backpackers and groups. Located on the banks of the lazy Qara ni qio river, enjoy direct access to Beqa Lagoon soft coral diving, plus the World’s # 1 Shark Dive, whitewater river rafting and kayaking, rainforest canopy zipline tours, waterfall treks, surfing, firewalking, cultural tours and more – all from this fun new resort that everyone is talking about! The Loft – Loft-style room. Lower level is furnished with King bed and superior ensuite bathroom. Sleeps 4. King Suite - Furnished with a King size coconut wooden bed or Twin-zip King size bed, comfortable lounge suite, superior bathroom and kitchen. Sleeps 2. Standard Room - Single, Twin and Double older rooms that include ensuite and kitchen. Additional roll-away beds are available. Perfect for those on a budget. Sleeps 2. Five Acres to Play On! Aqua-Trek Beqa also offers world-class soft coral diving in beautiful Beqa Lagoon. Experience soft corals in multihued kaleidoscopes of color and reefs teeming with fish, plus numerous caves and tunnels that are home to weird and wonderful exotic critters. Whether you're a novice or an experienced diver, Aqua-Trek Beqa can offer you first-rate diving adventures. The dive shop, located in Pacific Harbour, features top brand equipment, fast modern boats, and friendly and experienced professional staff. Aqua-Trek offers diving to all of the resorts in the Pacific Harbour area. 2-tank Ultimate Shark Encounter (Monday, Wednesday, Friday and Saturday) Make sure you book far in advance! The Shark Dive at the Bistro Only 10 minutes to site. Max depth is 24m and we do 2 dives at the site, the second 18m deep. Our world famous shark and big fish encounter is known as the #1 Shark Dive in the World. The site is an easy dive and is set up for diver safety. Divers stand behind a rope and view the sharks and big fish as the feeder puts food out. 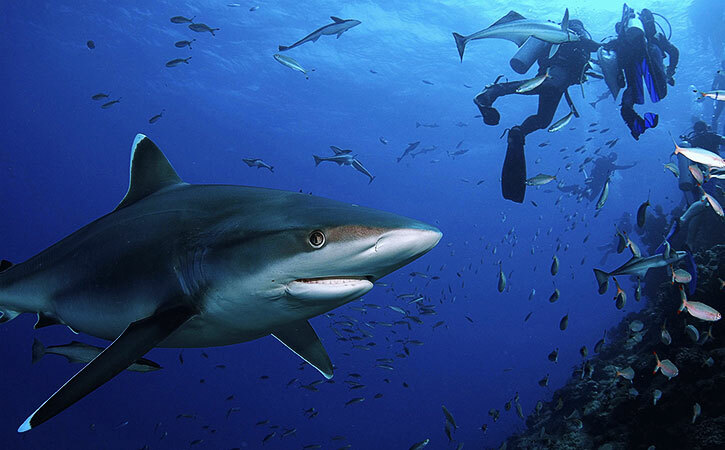 Divers can see up to 8 species of shark on one dive including multiple bull sharks and tiger sharks. We have the best safety record and it is a great viewing opportunity of the larger shark species found in the tropics. We also have a wreck at the site which divers can swim around after watching the sharks. Joes Best This is one large pinnacle that has a giant swim through covered in Soft corals. Blue Ribbon eels can be found here along with Lion fish and many other exotics, max depth is 20m. Pearl Rock This site consists of about 6 pinnacles in about 18m of water all are covered in beautiful soft corals. Average diving depth is around 14m where the greatest intensity of soft corals is located. This means a long dive time is assured. Glory Hole This site consists of about 3 large coral pinnacles again covered from the start of the coral heads at 5m down to about 14m. Max depth is about 20m. There is a swim through that has hanging soft corals in yellow and white soft corals. The coral heads have loads of purple and orange Antheas swimming around the soft corals creating a great fusion of colours. Carpet Cove This site has a wreck located on it. It is about 33m long old trawler. Covered in soft corals and Barracuda are often seen in the area. The wreck lies in about 30m of water after 15min bottom time you ascend up to the reef and swim around a number of coral heads that are covered in soft corals with many of the exotics to be found here, such as Leaf Scorpion fish. Seven Sisters As the name implies there are 7 coral pinnacles all covered in soft corals and adorned with colourful reef fish from exotics to the more common Butterfly fish and Moorish idols. Max depth is 18m. Coral heads start at 5m and the tops are littered with Anemone Fish and bright red soft corals. Million Dollar Point This is a shallow site for nice long dives at 16m max. Very photographic. Colours are intense due to shallowness of the site. Soft coral colours here cover the full spectrum of the rainbow. Very beautiful. Frogs Leap This site is on the outside of the lagoon, so it is predominately a hard coral site. Large plate corals adorn the reef. Good chance to see some larger fish swim by. Great dive site for beginners with no current at the site. Big drop off nearby means these corals are well fed and large. Max depth 20m. Soft Coral Plateau These are long gulleys running down the reef and finishing at coral heads and a wall. Lots of soft corals and good chances to find small exotic critters in the gulleys. Small white tip reef sharks can be seen here. Easy dive. Although we make every effort to ensure our prices are current, there may be a change or error. Please inquire for exact details & prices with connecting flights from your departure city or without air. Must be under deposit by March 31, 2016. Valid for travel through March 31, 2017. Singles add $425 for 5 Night Pkg. Add $535 for 7 Night Pkg. Non-divers deduct $380 for 5 Night Pkg. Deduct $600 for 7 Night Pkg.